WCI Cable contracted with Alcatel Submarine Networks to build and install their Alaska Northstar Network. The Nedonna segment of the NorthStar cable was constructed at the Alcatel manufacturing plant in Portland, Oregon. Cable was loaded on the Cable Ship Maersk Fighter at Alcatel’s dock. The vessel set sail from Portland on the morning of April 22, 1999. A pre-lay grapple run was conducted to assure the route was clear. Cable installation operations began on the morning of April 23rd, when a scuba diver swam a line from the ship through the surf. This was used to pull a heavier line, which was later connected to a bulldozer near the beach manhole. The bulldozer pulled the armored fiber-optic cable from the ship to shore. Buoys suspended the cable across the surface to avoid seabed contact. Cable laying and burial commenced on April 25 at 0800 hours in 7 fathoms of water with a submersible underwater plow. This is about .7 nm (nautical mile) offshore of the beach manhole. Initial plow burial averaged about .9 meter (2.9 ft). The F/V Abiqua, home ported in Garibaldi, was utilized to ferry personnel to and from Garibaldi, to act as a fishery patrol vessel and to remove a few crab pots that were in the cable route. These pots were replaced after the cable vessel and plow passed by. Only one "stuck" crab pot was unable to be moved, and the affected fisherman was paid for the loss of this trap. The plowing was much more difficult in the area beginning around 45° 39.8’ N x 124°19.5’ W in 83.5 fathoms, a fishing area commonly referred to as "the reef." The difficult plowing resulted in equipment breakdowns and slow progress. Cable burial in this area averaged .54 meter (21 inches). The shallowest reading recorded in this area showed just over 10 inches of burial. Once the plow was through the hard bottom at about 45°40.1’N x 124°25.6’ W, plowing became much easier and the corresponding burial depth increased. From this point to the end of plow burial, burial depth averaged 1.03 meters. Plow burial ended at 45°41.9’ N x 124°50.1’ W due to the inability of the plow to operate on the 11° steep slope. From this point westward, the Maersk Fighter surface laid the cable to a temporary termination point about 60 nautical miles (nm) offshore. This cable end was later picked up by the cable ship Fu-Lai, which spliced its cable to the segment left by the Maersk Fighter. The Fu-Lai laid its load of cable in deep sea on to Alaska. The Kigoria, from Victoria, BC, utilized a Phoenix III ROV (remote operated vehicle) to water-jet bury the cable from the end of plow burial to 45°41.4’ N x 124°56.1’ W. This was approximately 41.9 nm west of Nehalem Beach in 822 fathoms (1503 meters) of water. Repeated passes were necessary to achieve the one-meter depth. The Kigoria also used the ROV to verify the burial of an optical repeater, and other post lay inspection of the cable. Two other vessels, the F/V Olympic out of Newport and the F/V Prospector from Astoria, served as fishery patrol vessels, broadcasting warnings to mariners, and providing other logistical support services. These patrols continued until the cable was completely buried in the fishing grounds. Little fishing activity occurred in the area during the cable installation, and no conflicts occurred. One humpback whale was observed in the vicinity during post-lay burial. The Oregon Fishermen’s Undersea Cable Committee did not have an observer aboard the vessel contracted to bury the cable in the inshore/surf zone out to 11 fathoms. The installers hired a Norwegian firm, SEA TRENCH TECHNOLOGY, AS, to bury the cable. A workboat/barge was used to support a submerged trencher, which utilized waterjets to fluidize the seabed and allow gravity to sink the cable into the seafloor. The trencher was equipped with a guide roller secured on the armored cable to keep it on the cable path. The reaction force of the waterjets, which were driven by a 250-hp. diesel engine on the workboat, propelled the trencher forward. A six-inch waterhose delivered high-pressure water from the workboat to the trencher. Three scuba divers assisted in the operations, which were conducted May 10 to May 16, 1999. The distance trenched by this method was approximately 1250 meters, beginning at the point where the Maersk Fighter began its plowing. The Sea Trench Technology, AS, trencher Sea Trench T-5 buried the cable shoreward to the beach at a depth of one meter or more. 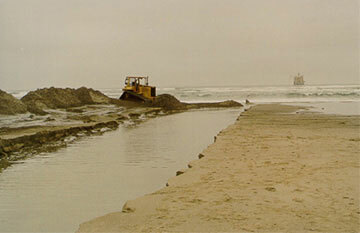 Trenching on the beach was accomplished by a team of seven track excavators at the time the cable was landed. Beach burial met or exceeded the specifications set forth by the State of Oregon and all permitting agencies. Cable has installed 8 four-inch PVC ducts including two with three 1-1/4" innerducts. This duct bank is buried under the paved road and is protected with a 36" lift of red CDF material. As an accommodation to the neighborhood, Northstar/WCI Cable has re-paved all of Lake Street including a previously graveled portion. No more environmental disturbance is required to land up to six marine cables through this duct system. From the turning box located on the Port of Tillamook Bay right of way and under the highway, Northstar/WCI Cable has installed 11 five-inch steel conduits to their property east of Hwy 101, thence to two 15'x9'x4' cable vaults adjacent to the north wall of the cable station. Northstar/WCI Cable's property west of the cable station and east of Highway 101 has been landscaped and wetlands have been enhanced to add to the beautification and environmental elegance of the area. The enhancement includes additional stream reclamation. The security system at the cable station has been designed and installed to work in harmony with the environmental setting of the wetlands surrounding the Northstar/WCI Cable landing station. This experience identifies the critical need and importance of involving fishermen in the earliest stages of submarine cable route planning. Because fishermen have extensive knowledge of the seafloor in which these cables will eventually be installed, it is essential that cable owners, installers, and contractors consult with the fishing industry early in the route selection process. This type of valuable exchange will not only assist these stakeholders, but provide cost saving intelligence to the entire process. Oregon fishermen and fisherman all over the world will benefit from these types of cooperative relationships. The Oregon Fishermen’s Undersea Cable Committee believes that all who were involved did an exemplary job given the hard seabed conditions on the selected route. The installation was successful due to the diligent efforts of the cable owner, installation contractor and all subcontractors.